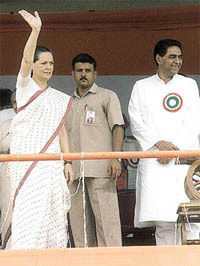 Congress President Sonia Gandhi on Saturday dismissed the Delhi State Bill, 2003, which was tabled in the Lok Sabha earlier this week, as “worthless” and said the BJP had played a dirty trick on the people. In spite of the ban imposed by the Supreme Court on display of hoardings and billboards on main roads and highways in the NCR, work is in progress for putting up large hoardings at about a dozen places around the Noida Toll Bridge. The Noida Authority has, however, in a letter to the ad agencies, objected to hoardings fixed on land owned by the UP Irrigation Department. Power blackout in villages a ruse to recover dues? The Delhi Subordinate Services Selection Board has denied allegations that it made no efforts to stick to the time limit fixed by the Delhi High Court for ensuring ‘zero vacancy’ in Delhi Government and Municipal Corporation of Delhi schools before the commencement of the academic session this year. The District Consumer Protection Forum has upheld the allegation of the Resident Welfare Association of Sector 27 that the UP Power Corporation had been dumping electronic meters on consumers in an autocratic and high-handed way. Upholding the charge preferred in the suit, the forum has directed the UP Corporation to form a specific plan for installing electronic meters and also ensuring and checking the quality of these meters before installation. The District Consumer Disputes Redressal Forum has directed the Bhiwani branch of the Life Insurance Corporation to clear the payment for two policies to a widow. The policies were made on the life of her husband. The corporation had earlier refused to make payments against the policy. Following this, she had filed a complaint with the forum. The decision was given jointly by the forum chairman Pradeep Kumar Mehta, members Prem Singh Ola and Raj Bala Sheoran today. For the past three months, Dadri town is in a shambles. Heaps of garbage greet people everywhere, on every street and corner. The town has converted into a veritable breeding ground for flies and mosquitoes, exposing the residents to the risk of an epidemic. Using official machinery to suit one’s convenience is an in-thing with leaders of the ruling political party of the day. A recent case in Gurgaon gives further credence to this theory. Swabhiman Rally to be a political springboard for Rao Narbir Singh? After senior Congress leader Rao Inderjit Singh, deputy leader of the Haryana Congress Legislature Party Capt Ajay Singh Yadav and HVP general secretary Anil Rao, Ahirwal is trying to make his presence felt as a rally organiser of the region. Different political parties and apolitical organisations have condemned the barbarous attack on scribes by the police during the elections to the office-bearers of Maharshi Dayanand University Non-teaching Employees Association (MDUNTEA) on Wednesday. Why can’t men live in peace with one another?” You are bound to ask this question yourself if you happen to visit the corridors of the district courts in Delhi (Tis Hazari). Lawyers in their black coats, litigants, policemen and witnesses besides others associated with the legal profession such as stamp vendors, clerks and typists, are seen hurrying hither and thither, anxiety writ large on their faces. It is almost like being inside a beehive. Perhaps, it is a picture of humanity in miniature. On the occasion of the 29th Barsi Bhandara of Param Sant Kripal Singh Ji Maharaj, thousands of people paid rich tributes to him at Kirpal Bagh today. Social and religious leaders spoke of his vision of spiritually enlightened world society and of a Golden Age, which he had said at the first Human Unity Conference in 1974, at the Red Fort Grounds. The Ninth Delhi Book Fair, with a special focus on children, was inaugurated by Union Minister of State for Commerce and Industry Satyabrata Mookherjee here today. 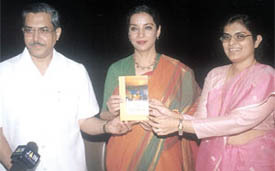 Speaking at the inauguration, the minister called upon the publishers to reduce the prices of books to make them accessible to a vast majority of people. He said the publishers should ensure that knowledge is available cheaper to a vast majority of people who want to read, by reducing prices of the books. Sonepat city and its suburbs continue to be in the grip of power crisis for the past few months. The authorities of the Uttar Haryana Bijli Vitran Nigam (UHBVN) have failed to maintain regular power supply in the domestic, industrial and agriculture sectors. Three persons have been killed in the city and suburbs since yesterday. A person was killed when a jeep hit him at village Khapadwas yesterday. According to report, the deceased, identified as Ramanand, was hit by the jeep owned by a liquor contractor when it was being turned after delivering the liquor to a vend at village Khapadwas. Ramanand died on the spot. The Union Minister of State for Youth Affairs and Sports, Mr Vijay Goel, unveiled the road name plaque of Maharaja Agrasen Marg at Laxmibai Nagar this morning in a simple function organised by New Delhi Municipal Council. The Meerut police have claimed to have busted a gang engaged in printing fake currency with the arrest of a person, Sharafat. Fake notes of Rs 100 and Rs 50 denominations worth Rs 2,000 were seized from his possession. Blackmailing led to the murder of a youth, whose body was recovered from a deserted place in Rohini area in North-West district a few days back. He was residence of Mangolpuri. Mr S.P.Singh, a Junior Engineer with the Public Health Department, was allegedly attacked and injured by the sarpanch and his son at Rohat village, about 5 km from here yesterday. Girl students of local Hindu College have set a record by grabbing the first five positions in the MSc Chemistry (Previous) and first three top positions in MSc Physics (Final) examinations of Maharshi Dayanand University, Rohtak, this year. The Students Federation of India (SFI) and the Chhatra Lok Janshakti (CLJ) today announced their decision to take on the “communal” Akhil Bharatiya Vidyarthi Parishad (ABVP) and the “ideologically inconsistent” National Students Union of India (NSUI) in the coming Delhi University Students Union (DUSU) elections. Sir Ganga Ram Hospital has overtaken other hospitals in the country in performing Percutaneous Endoscopic Gastrostomy (PEG) on a newborn. Four months after Dr Neelam Mohan, Consultant Pediatric Gastroenterologist and Therapeutic Endoscopist, took up the challenge of trying the procedure on a newborn for the first time, she has reason to compliment herself for her bold decision. Drawn matches were the order of the day at the Jawaharlal Nehru Stadium in the Delhi Soccer Association-SAIL Senior Division Football League Championship on Saturday. Arjun Singh of Delhi shot a superb eight-under 64 on the final day for a four-day total of 20-under 268 to win the TNGF-KONE Open 2003, the third leg of the Hero Honda Indian Golf Tour on Saturday. Devastating bowling performances by leg-spinner Rajat Sharma (4 for 1) and Manoj Gupta (4 for 14) enabled Ramjas School No 2 defeat Diwan Chand Arya School by 117 runs in the opening match of the third Ramjas Inter-School Under-17 Cricket Tournament at the Ramjas Sports Complex ground. 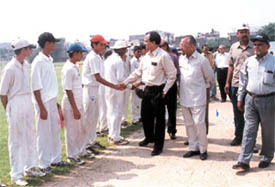 Players being introduced to the chief guest before the start of the Ramjas School Cricket Tournament. Children Valley School at Preet Vihar has taken the initiate to promote karate-do in the school for all age groups, in a move designed to equip the children adept at self defence in these uncertain times. 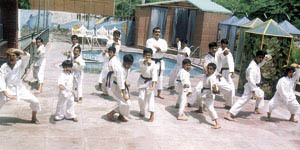 Children practising karate-do under the supervision of chief instructor Naval. The Government of NCT of Delhi has set a deadline of September 30 for completing the work of repairing the roads that have developed cracks and potholes this monsoon.